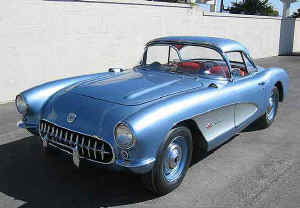 The 1957 Corvette was an amazing automobile in its day and continues to be one of the most sought after classics. The optional 283 cubic inch engines with radical fuel injection and new 4-speed transmission proved to be a winning combination in factory sponsored racing competition. The 1957 Corvette was the first mass produced American automobile to offer 1 horsepower per cubic inch of engine displacement (283hp/283ci).